Try this super creamy hummus recipe, using roasted red peppers to give it a tasty zip. This recipe makes approximately 4 cups of hummus. Keep it on hand for a satisfying, healthy snack. In a food processor, combine tahini and half the lemon juice at the highest speed until tahini is pale and fluffy, a little over 2 minutes. Add remaining half of lemon juice 1/2 tablespoon at a time if the mixture is too thick and sticks to the sides of the bowl. Next, turn down the speed of the processor and add the garlic while the processor is still running. Add olive oil in a slow stream, alternating with about 2 tablespoons of garbanzo beans at a time, until all the olive oil and garbanzo beans have been added. 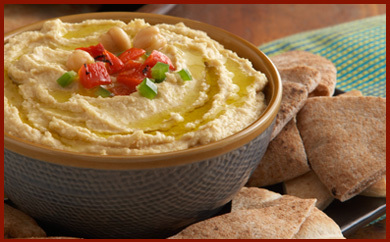 If the hummus is too thick, stir in water 1 tablespoon at a time, or any remaining lemon juice. Season to taste with salt and pepper. At this point, you have a basic hummus. Rinse and dry your red bell peppers. To roast the red peppers, turn one burner on your stovetop to high and place pepper(s) directly on the burner. Using tongs, occasionally turn the peppers until they are blackened all over. Remove pepper(s) to a bowl and seal bowl with plastic wrap to “steam” them until they are cool enough to handle, about 10 minutes. Remove from bowl, and “peel” the thin, papery outer layer of the peppers. Cut open, remove stem and seeds. Add 3 of the roasted red peppers to the hummus in the food processor and process at medium speed. Put hummus in serving bowl, drizzle with more olive oil, top with the remaining roasted red peppers.